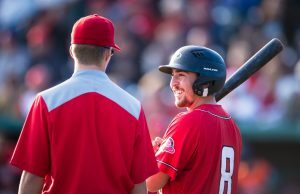 It was the perfect ending for one of the most beloved members of the Okotoks Dawgs organization. “I couldn’t even sleep last night. I was so excited knowing that this was going to happen in my final game,” said Eduardo Sanchez. The Dawgs led 6-3 when Sanchez ran out for his first save of his baseball career. The crowd was cheering loud and the playoff-bound Lethbridge Bulls were ready for one final push at a comeback. Looking around, sensing the situation, Sanchez fired his first warm-up pitch halfway up the backstop. The crowd burst out in uncontrollable laughter. That’s just the type of player Sanchez is; enthusiastic, entertaining and amusing. But most of all, he’s a great ball player. 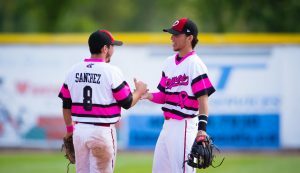 All the wonderful aspects of Sanchez as a person and as a ball player were displayed Sunday afternoon in the Dawgs final Western Major Baseball League regular season game. The utility infielder from Mexico City, Mexico, who first joined the Dawgs Academy as a 14-year-old, played all nine positions and exited with two outs in the top of the ninth to a standing ovation by the charged up crowd that has seen him grow up in front of their eyes for seven years, after he struck out Nick Ankermann. OKOTOKS, Alta. – July 22, 2018: The Okotoks Dawgs won 9-5 against the Edmonton Prospects at Seaman Stadium on Sunday afternoon. 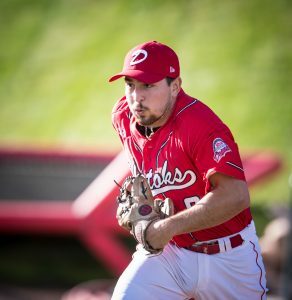 (Angela Burger/Okotoks Dawgs). Coming out for the pregame national anthem, Sanchez was in full catchers gear and ready to receive starter Graham Brunner, a current pitcher still with the Dawgs Academy program. Brunner allowed one base runner in the first, but there was never an opportunity for Sanchez to back door the runner or try and catch someone stealing, so he went about his day. From there, he did a lap of the infield, starting at first and making his way around the infield, before heading out to the outfield in the sixth. The only action Sanchez saw was a deep, carrying fly ball in the eighth by Blake MacDonald that sailed inches past his outstretched mitt a few feet shy of the warning track. 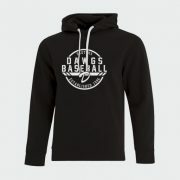 As the inning switched over from the eighth to the ninth, Sanchez hopped over the wall along the first base foul line and into the Dawgs’ bullpen to prepare for his first and only pitching experience with the Dawgs. The only issue was that Sanchez was due up third and the first two hitters only saw a combined four pitches. Sprinting out of the pen with his patented big smile, Sanchez took a couple seconds to gather himself before grounding out on the second pitch he saw. With his walk-up song blarring through the speakers and the crowd on its feet, Sanchez warmed up on the mound and prepared for his first batter. On a 2-0 pitch, Sanchez got Dustin Braun to pop up to second for the first out. That’s when Dawgs Pitching Coach Joe Sergent made his way to the mound. “The plan all along was for him to get one out and then go to Craig Smith because he needed work,”said Sergent. “But when I got out there, everyone was booing me! The crowd cheered as Sergent walked back to the dugout, as they wanted an encore from Sanchez. With the count 2-2 on Ankermann, Sanchez crossed him up with a pitch on the outer half, as home plate umpire Jeff Wang rang up Ankermann. “This was great. It’s why you show up to the ballpark everyday, so you can have fun and people can cheer for you,” said Sanchez. Walking off the mound to another standing ovation, Sanchez showed his appreciation for the crowd and the community that he has called home for seven years by tipping his cap in a moment he likely won’t soon forget. Playing all nine positions is a feat that not many ball players can claim to have done. The Dawgs haven’t had a player cover the field since Mark Riendeau in 2014. Playing all nine, picking up a hit at the plate and a strikeout on the mound has to be on the list of Sanchez’s greatest memories with the Dawgs. Coming to Canada and the Dawgs from Mexico in 2012 for his Grade 10 year, Sanchez, won the national championship that summer and competed on two more incredibly talented teams before graduating to college ball. “Coming here with Alejo Lopez definitely made the transition easy, but really, it was the great guys on the teams that made it easy for me and made me feel like family. They were all very welcoming — very Canadian — and that’s what made my time so enjoyable,”said Sanchez. 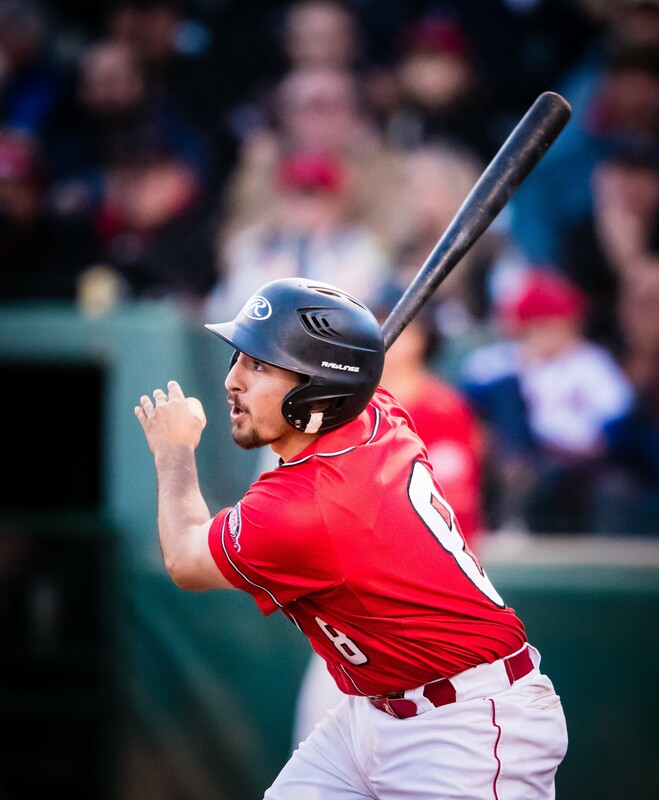 Once he finally found his way to a National Collegiate Athletic Association Division 1 program in Central Arkansas University, Sanchez made his way back to the Dawgs of the WMBL in 2017. Sanchez previously played a handful of games with the Dawgs in his senior year with the Academy, but he became a mainstay in the lineup last year and added to his legacy when he set the single-season franchise record with 31 walks. That record didn’t stand long, as Sanchez broke his own benchmark this year with 33. Sanchez has always been top of the order hitter, switch-hitting for high averages last year .341, and again this year with .313 average and an incredible .431 on-base percentage. But he also showed how great of a teammate he can be. When the Dawgs finally convinced Abdiel Alicea (Tabor College) to join the program, Sanchez got squeezed out of his usual spot at second base. But the adaptable infielder made a quick adjustment and settled into life at third base for the most part. “He’s a great example of a guy that just goes out there and works and gets the job done. 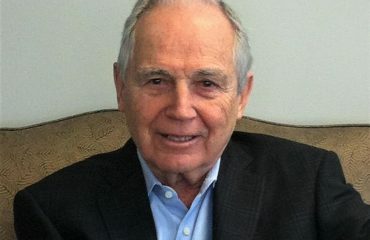 What more can you ask from the guy?”said Schmidt. After this season, Sanchez has one final semester to knock off before he gradates with a finance degree. 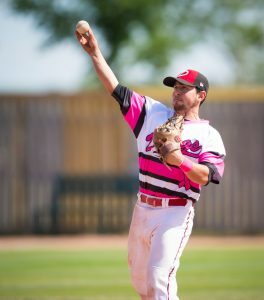 After that, he stated he might return to Okotoks to give back to the program that got him to where he is today, or he might look for work in his new field and start building up his resume. But first things first, there is still work to be done at Seaman Stadium. The only thing missing from Sanchez’s brilliant career with the Dawgs is a WMBL championship — and maybe a food item named after him. 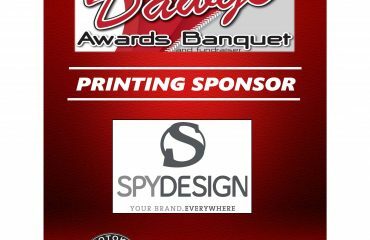 The Dawgs have certainly positioned themselves well for the first task, as they enter playoffs riding a 11-game winning streak and saw multiple players record some of the greatest single-season performances in franchise history. “It would mean the world to win a title here. These fans have been so great for so long and they haven’t won in a while. I can’t think of a better way to go out than going out on top with a championship,” said one of the all-time great Dawgs, Sanchez. 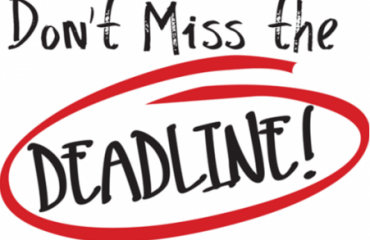 Season Ticket Renewal Deadline Approaching!